Rightly or wrongly, for many the final nail in the coffin of their near-term upgrade plans is the historic increase in MSRP of NVIDIA’s RTX 20-series. Until prices do go back to some semblance of normalcy many people feel the value of this new generation of video cards is sorely lacking. We here at RealHardwareReviews believe it is in our loyal readers’ best interest to continue showing excellent GTX 10-series options for this large – and vocal – group of buyers. This certainly is disappointing and underscores NVIDIA’s monopolistic tendencies. After all, what started out as nothing more than a short series of articles geared mainly towards the ‘bargain hunters’ now has morphed into an almost survival guide for PC gaming enthusiasts. The first in this now expanding list of value deals is the Gigabyte AORUS GTX 1070. We have chosen this particular card as it is Gigabyte’s top tier model that has every feature Gigabyte could think of included. This means three massive ‘WindForce’ fans atop a custom cooling solution (aptly named ‘AORUS Cooling’) that can harness the power these fans offer. In fact, it is so robust the form-factor of this card is what is best described as a ‘2.5 slot plus’ model which may not exactly be as thick as some but does require 3 slots for proper clearance. We will go over the pros and cons of using an… oversized video card in the review but one thing is for certain. This card offers impressive levels of performance. Specifically, it comes with a base clock of 1632 and a boost of 1835. This may not precisely be the highest factory certified specifications available… but thanks to the cooling solution Gigabyte uses these are mere suggestions. 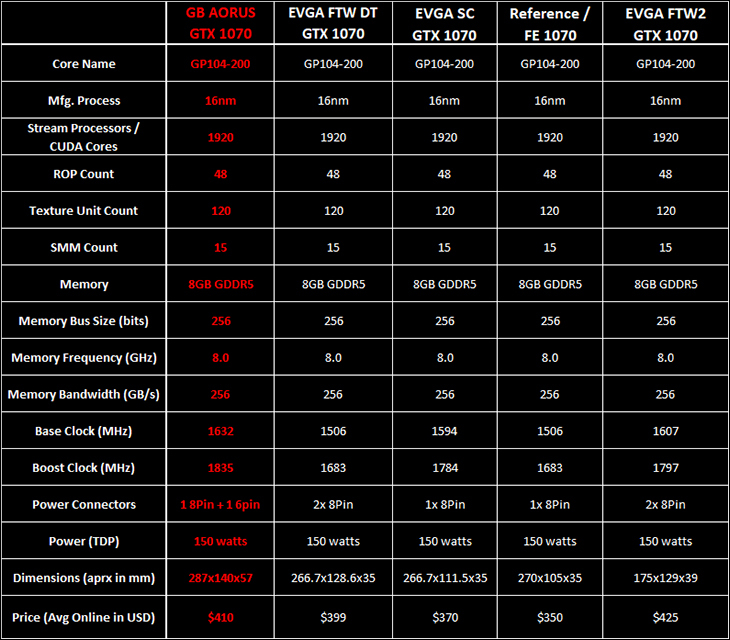 Even without manual overclocking this card will hit levels almost unheard of outside of manual overclocking endeavors. Levels that in many instances skirt the very edge of NVIDIA GTX 1070Ti territory. 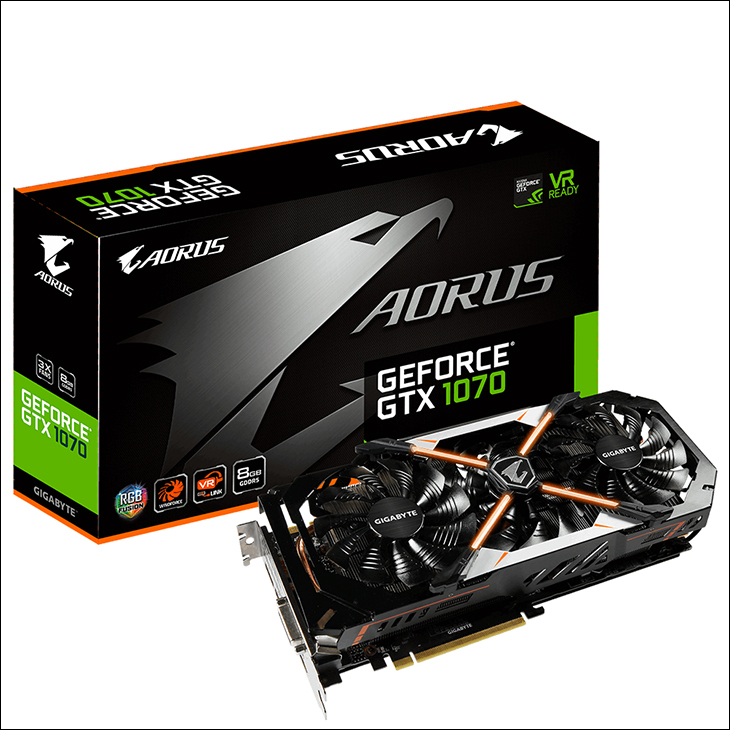 On its own this certainly does make the Gigabyte AORUS GTX 1070 worthy of consideration, but make no mistake this card has almost as much value as it does performance. Yes, it may indeed be built to take on the ASUS STRIX, MSI Gaming Z, or even EVGA FTW2’s of the video card market but it is not priced like one. Instead of expecting to spend ‘FTW2’ amounts of money Gigabyte only charges $410 (and this price is falling like a stone). This places it more firmly in the ‘upper mid-priced’ region of the 1070 series and only $40 more than a more entry level orientated EVGA SuperClocked 1070 (or a mere $10 more than an EVGA GTX 1070 FTW DT). 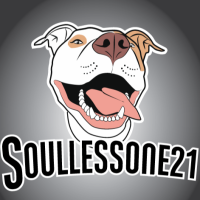 It is for this reason we have decided to start with this card and restart the expansion of our efforts to bring you cards you should be thinking long and hard about. With such data it may just be a way to help weather the first gen RTX storm. Then in a year or two then think about upgrading to a RTX 30-series card. A series that will be 7nm based, may actually have enough Ray-Tracing games to take advantage of the ‘wasted spaced on the core’ that is NVIDIA RTX 20-series’ main claim to fame… or maybe by that time NVIDIA will have come to their sense and reduced the price of RTX 20-series enough this group of non-buyers will actually be able to seriously consider purchasing one. In the meantime, cards like the Gigabyte AORUS GTX 1070 should provide more than enough performance for those not interested in 4K gaming.